Drinks producers rely heavily on coding and marking solutions to provide quality codes for purposes of traceability and brand accentuation. These codes are printed or laser marked onto primary, secondary and tertiary packaging – in other words from your product all the way to the pallet they are shipped on. 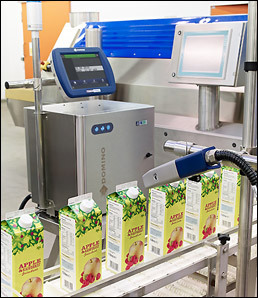 Technologies which are particularly relevant to the beverage sector include continuous inkjet printing (CIJ), thermal inkjet printing (TIJ), drop-on-demand for Outer Case Coding, print and apply labelling – including palletisation (PALM / P&A) – as well as laser marking. In addition to these mainstream requirements, the brewery industry tends to invest in specialised keg labelling systems to improve keg retention and reusability. Traceability itself is driven partly by legislation but predominantly by key stakeholders such as retailers, resellers and consumers. A consumer wants to have confidence in the quality and freshness of the drink that they are enjoying. A retailer aims to ensure that customer confidence and satisfaction is derived from each purchase, but must also be able to remove a defective batch of products from shelves as quickly as possible in the event of any issues. A drinks producer uses the traceability codes to identify and isolate a defective batch in order to review and rectify the production issues which may have affected a retailer and its consumers. The aspect of using coding and marking to accentuate brand engagement is becoming more widely adopted by large Multinational companies (MNCs) and smaller craft breweries and distilleries alike. An organisation is able to print live data onto a bottle or can in the form of a 3D datamatrix or QR code, which a consumer may then use to access information or affiliated websites. Companies are able to print logos and messages onto outer cases on-the-fly thereby negating the need to commit to large stock of pre-printed boxes/cases. Promotional coding is a growth trend whereby competition codes are printed on a bottle, label or on the backside of a label and a consumer then inputs these on a website to win potential prizes. This drives customer engagement, brand loyalty and data capture on behalf of the brand owner. Domino continues to pioneer coding and marking, with increasing levels of research and development in existing and associated technologies. For example, providing complimentary ancillary solutions and offering unique business model solutions to customers. It was Domino that introduced the first service-free printer to the market – the current i-Tech A-series CIJ printer. The printer merely needs an operator to replace the i-Tech module (containing ink filters) once per year without the need for any tools. This was a game-changer in the CIJ printer industry and has since been adopted by beverage customers across the globe. Industry-defining technology such as Domino’s i-Tech printer range means Domino remains a key supplier to the drinks industry. Strong relationships are embedded across most multinational corporations involved producing soft drinks, bottled water, beer and cider brewers, distilled spirits, wine and new rising categories. The beverage sector is constantly in search of higher line speeds, increased outputs, lower costs of ownership, higher equipment efficiencies – all in the pursuit of increased market share and resultant increased revenues and profit margins. Recent coding and marking innovations at Domino designed specifically for the demanding beverage sector. These have focused on high speed print and apply labelling equipment, fibre laser marking onto primary packaging, as well as keg labelling. Kegging remains an important way to transport mass volumes of beer and cider around the country, as well as providing a key route to the pub and bar market for most brewers in the United Kingdom. The British Beer and Pub Association estimate that kegs replace approximately 7.5 million bottles and cans in the UK ever year. Kegs therefore ensure that the industry is able to continue to provide a sustainable and environmentally beneficial way of transporting mass liquid volumes between breweries and pubs, bars and hospitality venues. However the BBPA also estimate that the loss and misuse of kegs cost the industry over £50 million per annum. Domino therefore devised an automated keg labelling solution for larger breweries to assist in the retention and reusability of existing kegs. Several UK breweries have invested in this technology to drive operational efficiencies on their keg lines and eliminate the need for manual labelling of kegs by hand. The keg labelling system devised by Domino is simple, reliable and designed for harsh, wet environments to ensure that the machinery is robust enough to operate for many years to come. In addition, the cost-effective nature of the solution ensured that breweries have achieved a rapid return on their investment. Domino looks beyond core machinery however. An example is the recently launched yellow ink for the brewing industry. Yellow and white inks are designed for amber and green bottles to print Best Before and batch codes. Domino’s new 2YL955i yellow ink has been through an extensive research and development phase, and launched in early 2016. It has since been tested by many large breweries who have subsequently decided to replace their existing inkjet printers with new Domino printers and the affiliated yellow ink. The ink has been designed to be applied to wet bottle applications and where chilling/refrigeration are required. The ink has very strong adhesive qualities, as well as providing exceptional code contrast on amber and green bottles. Recently drinks producers are also requesting ancillary applications and software to improve the operational performance of their production lines – especially in relation to quality control. Therefore an important addition to coding and marking equipment these days are scanning and camera vision systems for code recognition and quality assurance. Any beverage product which reaches a major retailer with either an unreadable code, incorrect code or no code at all is liable to a significant penalty. Some customers have advised that they have to pay annual penalty fines to retailers of over £100,000 due to coding issues – which may be caused by simple operator errors or a printing issue (causes may be poorly maintained printers or ageing technology in particular). The vision systems can identify and flag any issues prior to products being palletised. Beverage producers are also able to mitigate against operator errors by adopting Domino QuickDesign, an integrated software solution which can be integrated with many ERP and stock control systems. It is able to coordinate communications between all on-site coding equipment thereby ensuring better management and control of coding equipment. When coupling QuickDesign software with scanning and vision systems, a producer can essentially prevent any coding issues from reaching a retailer. In the developed economies in particular, where low growth rates driven by macroeconomic issues, as well as the threat of increase regulation and taxation on sugared drinks and alcoholic beverage, means beverage manufacturers rely on partners to provide the innovations to facilitate growth. 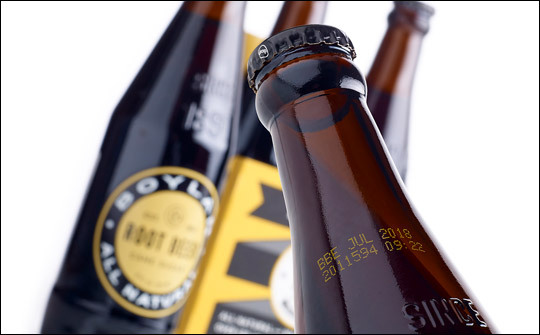 All in all, coding and marking onto packaging for a beverage producer is a key driver in economic and social terms, protecting brands from counterfeit and product recalls, and increasing consumer confidence. There are a variety of technologies available, but choosing the best solution for your business needs requires an understanding of packaging and production processes, business objectives, as well as satisfying the consumer, legal and environmental landscape of the today’s world. Domino is the leading business within Domino Printing Sciences. Founded in 1978, the company has established a global reputation for the development and manufacture of coding, marking and printing technologies, as well as its worldwide aftermarket products and customer services. Today, Domino offers one of the most comprehensive portfolios of complete end to end coding solutions across many industrial sectors, including food, beverage, pharmaceutical and industrial products. Domino employs 2,600 people worldwide and sells to more than 120 countries through a global network of 25 subsidiary offices and more than 200 distributors. Domino's manufacturing facilities are situated in China, Germany, India, Sweden, Switzerland, UK and USA.